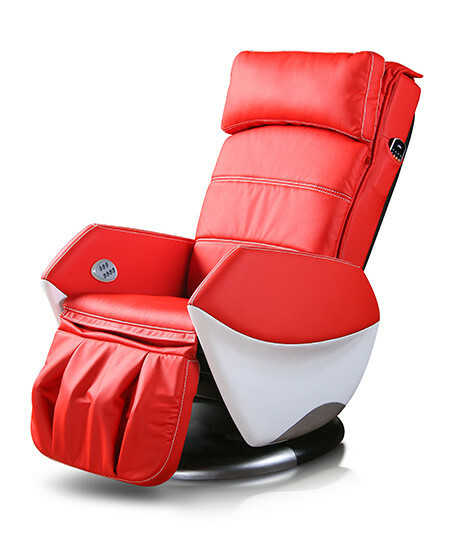 A set of mechanical massage hands is designed which can move upwards or downwards, is driven by two wheels, guided by four wheels and is silent in operation. Four massage modes are offered, they are kneading, tapping, knocking, and synchronous kneading or tapping. Automatic massage of the upper body is available (three automatic modes can be selected: neck or shoulder, upper body and back/waist). Manual massage of the upper body is available (three kinds of massage areas, overall, partial and fixed point can be selected). The mechanical hands may be adjusted upwards or downwards when massage is performed on a fixed point. Three speeds are available for each massage mode. The width of massage balls may be set to wide, medium or narrow under the massage modes of tapping, knocking and stopping. The calf may produce a group of vibrations with 2 vibrating massage balls. Kneading massage of the calves, three selectable speeds are available. The calf rest may be lifted or lowered independently; the calf rest and the backrest may also be lifted or lowered together. The height of shoulder massage may be adjusted, and a memory function for massage positions is available. Two sets of controllers are available, a simple controller fixed on the massage chair and a hand held wireless remote LCD controller.